This is the 1992 Bathurst winner sold by Biante. 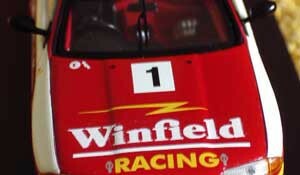 The model is in 1:43 scale and was produced without Winfield cigarette decoration. Interesting Note – this is the “You’re a pack of Arse Holes” Richards/Skaife winner that actually ended the race planted in the concrete. Summary: A nice model of another Bathurst winner.